Occasionally lies down and falls asleep. Bites the enemy with Obsidian teeth, dealing 433 Elemental damage. Deals 197 Beast damage and forces the opponent's highest health pet to swap into battle. Go into a frenzy, dealing 295 Elemental damage and increasing the damage you deal by 25% for 3 rounds. Look adorable, becoming unattackable for 2 rounds. During this time, Puppies of the Flame attack the opponent, dealing 98 Elemental damage each round. When the opponent triggers the trap, they will take 394 Elemental damage and be unable to attack for 1 round. I agree with Damiasylver04! That seems oddly out of place. It shouldn't be that hard to swap models. Was hoping Puppies of Flame would be the same model as he is, but they're molten corgis. For PvP I really like the 305 speed of the S/B breed. 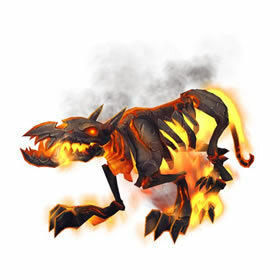 Retrieve, Puppies of the Flame and even Magma Trap (to a lesser extent) are much better if you can get them off before your opponent's attack and the 305 speed will beat a lot of other pets to the punch.